I wish the title bar in WordPress that the option to make numbers with powers because this recipe is also known as P(3)-P to the three. P cubed. Last night I decided I wouldn’t set an alarm to wake up on this fine Saturday so I got to sleep later than usual. A nice, lazy, weekend morning where I had not a care in the world. I was all set to make eggs as I do everyday but I was sick of eggs and the can of pumpkin was calling to me from the cabinet. Since my house was chilly and fall-like I decided to go all out. 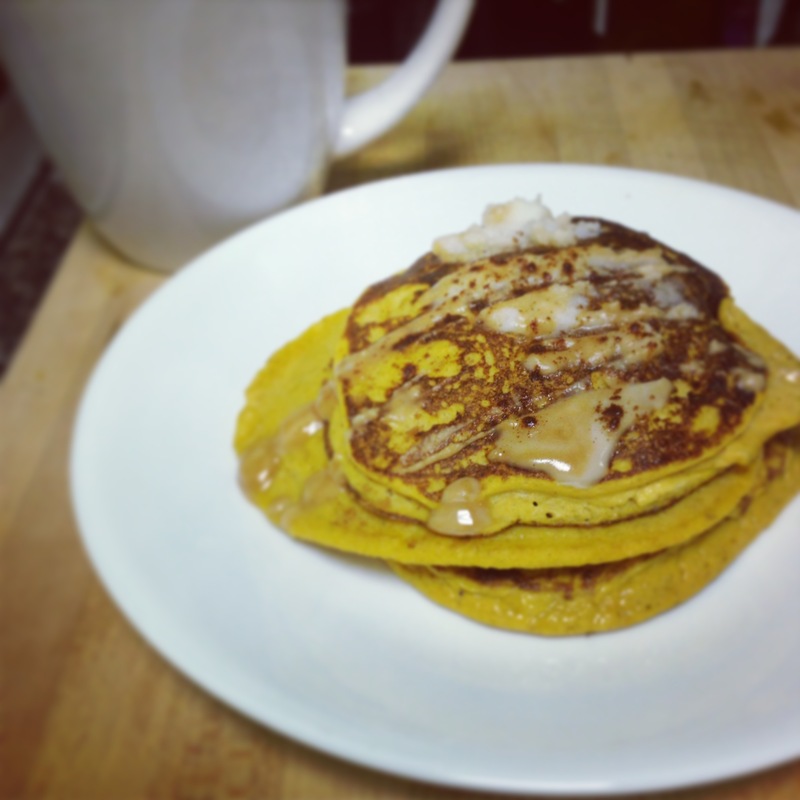 I attempted a pumpkin latte, made these pumpkin pancakes and made a pumpkin smoothie bowl later in the morning for a snack. I have a mild pumpkin obsession all the time but today it got weird. These pancakes though? Ugh. 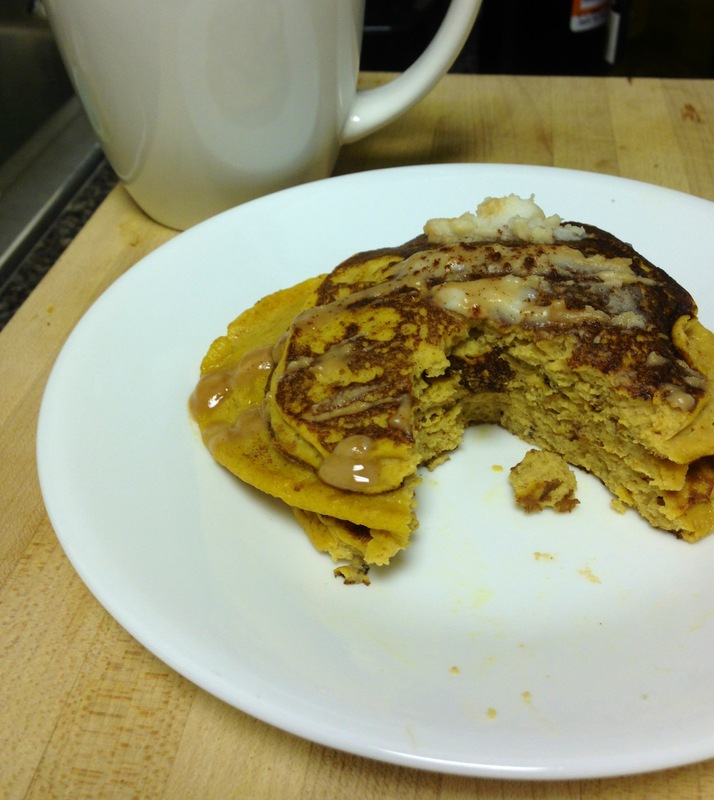 The best Paleo pancakes I’ve ever made. They had taste, they didn’t break when flipped and they looked delicious. Perfection. 1/2 serving vanilla protein powder (I happened to have this on hand to use as a binder. I’ve made these with coconut flour before too. Usually about a tablespoon/a little less with a pinch of baking soda). **With the “binder” I add until the consistency is not runny but not too thick. About the wetness of regular pancake batter. Turn oven on as low as possible and place a plate inside. 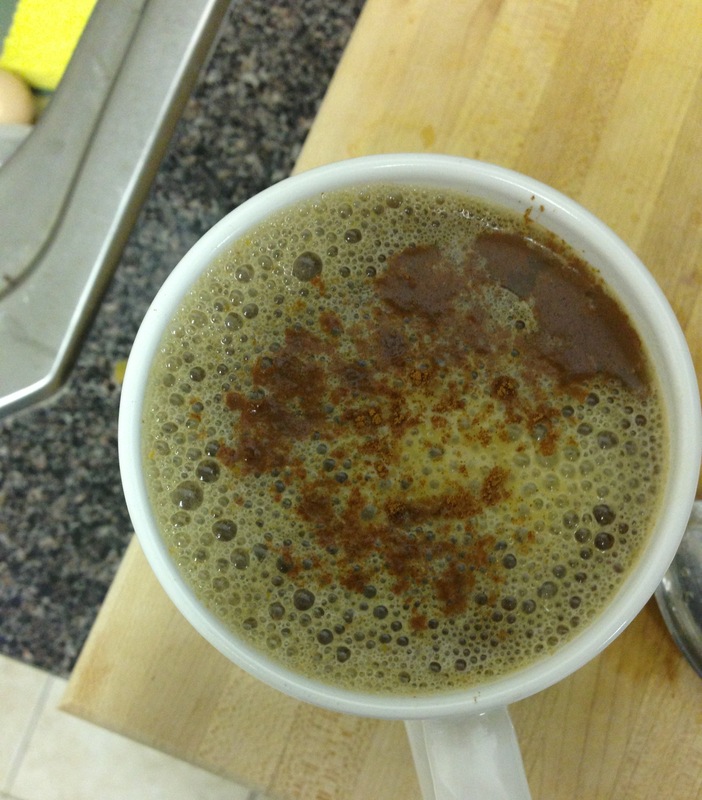 Mix the pumpkin, vanilla, cinnamon, binder of choice in a bowl until everything is well incorporated. Heat up coconut oil in a frying pan. When it is hot, spoon a thin layer of the pancake batter into the pan. Cook approximately 2 minutes or until the sides begin to brown and the pancake starts forming small bubbles. Flip and cook another 2 minutes. Put pancake on the warmed plate and repeat with all remaining pancake batter. To top, melt coconut butter in a pan with a tiny drop of vanilla (optional). When melted, drizzle over pancakes. Sprinkle with cinnamon. But really. One of the things I get most excited about since going Paleo is the occasional ice cream. 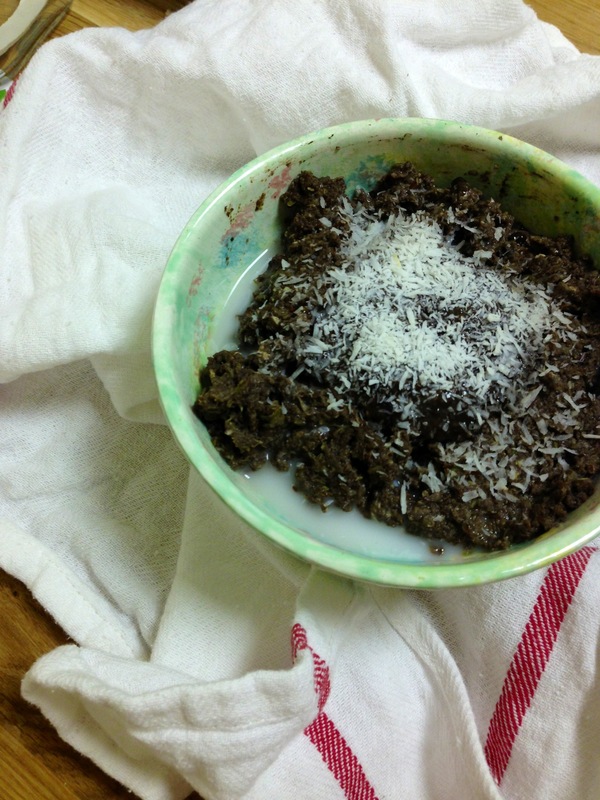 After making some chia seed pudding the other day, I had leftover coconut milk and decided to play around a little. Ice cream was born! Put frozen blueberries in a pan over low heat. Cook until the blueberries begin to burst. Meanwhile, mix coconut milk and vanilla in a freezer safe container. 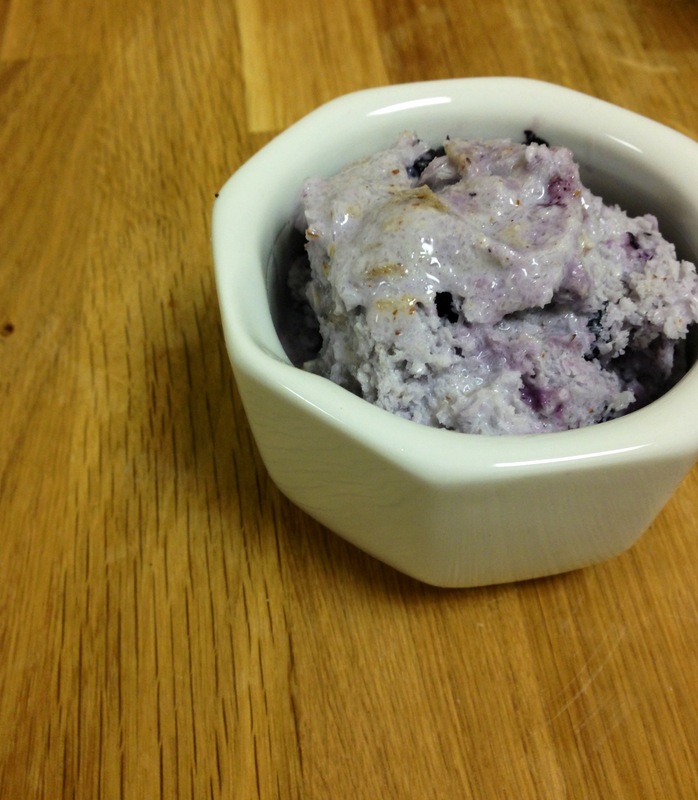 When the blueberries are warm and bubbly, stir into the coconut milk. Cover the container and put into the freezer for 1 hour. Remove and mix, scraping the icy parts from the sides. Repeat every few hours. When the ice cream has firmed up a bit, mix the almond flour, honey and almond butter in a separate bowl then sprinkle into the ice cream. Mix and place back into the freezer. Freeze until the ice cream is your desired consistency then scoop into a bowl. If you aren’t stirring it every few hours, it might need to sit for a few minutes to soften up.